In a reassessment of modern conservatism, noted historian Kathryn S. Olmsted reexamines the explosive labor disputes in the agricultural fields of Depression-era California, the cauldron that inspired a generation of artists and writers and triggered the intervention of FDR’s New Deal. 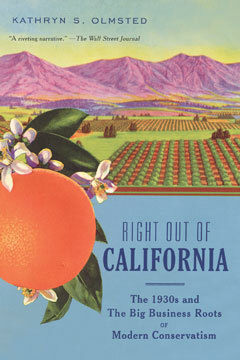 Right Out of California tells how this brief moment of upheaval terrified business leaders into rethinking their relationship to American politics—a narrative that pits a ruthless generation of growers against a passionate cast of reformers, writers, and revolutionaries. At a time when a resurgent immigrant labor movement is making urgent demands on twenty-first-century America—and when a new and virulent strain of right-wing anti-immigrant populism is roiling the political waters—Right Out of California is a fresh and profoundly relevant touchstone for anyone seeking to understand the roots of our current predicament. Kathryn Olmsted writes about the phenomenon of modern conservatism and its roots in California big business. Publishers Weekly reviews Kathryn Olmsted's Right Out of California, calling it "an accessible work that aids in contextualizing the rise of future conservative leaders."